When was the last time you took a few minutes to check the condition of your tires? If it’s hard to remember, you’re not alone. Because of their long treadlife and overall durability, tires are often perceived as an almost static vehicle component, no different than many other mechanical parts. But tires do change: Seasonal changes and temperature fluctuations, mileage accumulation, rough roads, and more affect your tires. Because of their changing condition and immense influence on your car’s capability and safety, our tires deserve much more attention. Tire awareness and monitoring is effectively optional here in the United States, but European road laws and regulations reflect the fact that tires are paramount to overall road safety. In the United Kingdom, for example, drivers can be fined up to £2,500 (more than $3,000 U.S. dollars) per defective tire. Nevertheless, in the UK it’s estimated that 1,200 road casualties per year can be linked to underinflated, damaged, or otherwise defective tires, according to TyreSafe.org. All of those channels, cuts, and grooves in your tires’ tread, yep, they’re important. Run tires down below the minimum tread depth and that engineered tread functionality is severely diminished. If tires are below minimum tread, you’ll see the greatest performance deficiencies on wet roads and in adverse road conditions. In other words, right when you really need and want full tire function. 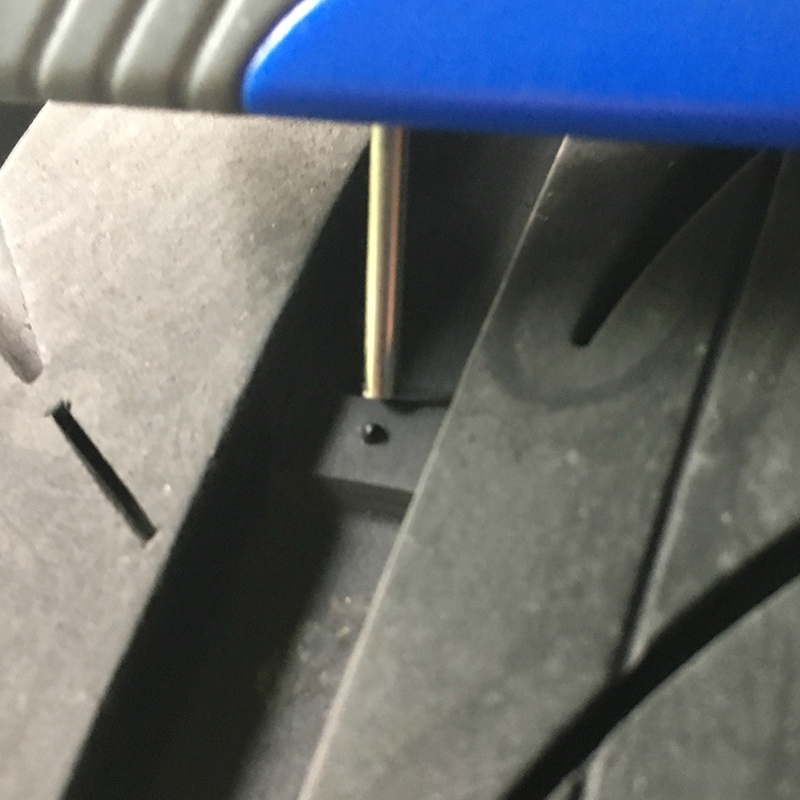 You can conduct a simple check of tread depth visually and by hand, but an inexpensive tire tread depth tool like this one from Michelin will provide greater accuracy. 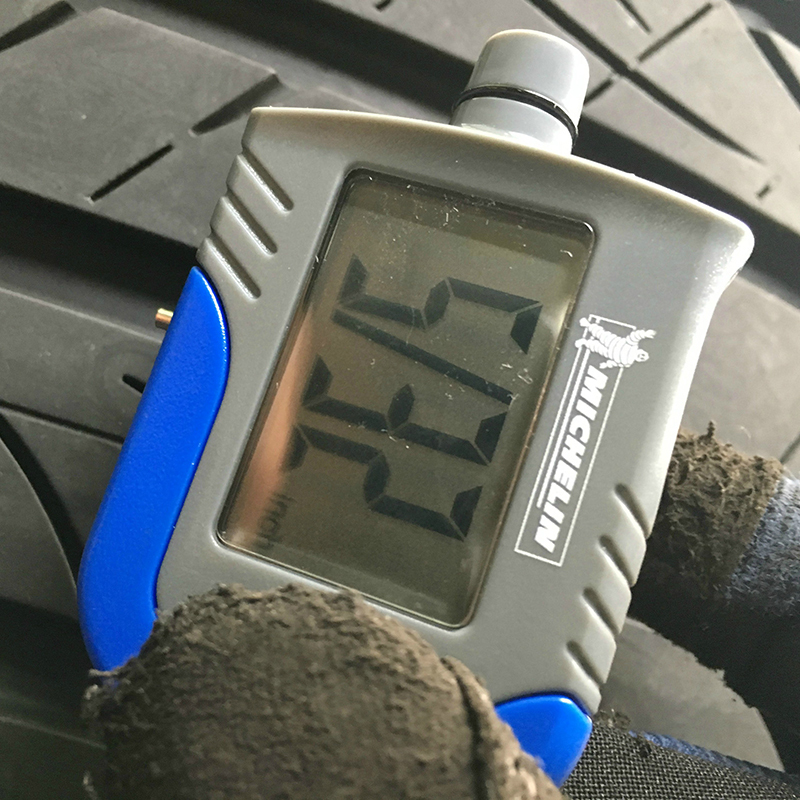 In lieu of a tool, refer to the minimum tread depth indicators (“wear bars”) that are built into the channels of tires. When the surrounding tread is level with the indicators, your tires have reached minimum tread. Keep in mind that while the official minimum tread depth of tires is 2/32”, you’ll be experiencing diminished performance before you hit that mark, especially in rain or snow. Tire pressure is also key to proper interaction between the tire and road surface. Too much or too little tire pressure will shorten tire treadlife, create uneven treadwear, and inhibit proper tire function – particularly during sudden or evasive maneuvering. Incorrect tire pressure creates uneven road surface contact across the width of the tire, and therefore compromised performance. 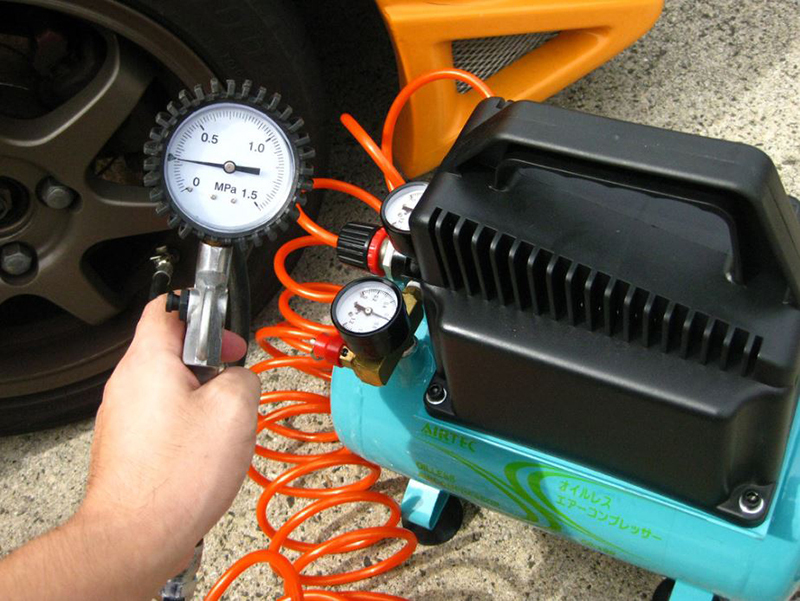 How do you know the appropriate tire pressures for your vehicle? Open the driver’s door and find the information “card” on the doorjamb (often just below the latch). Refer to that for tire inflation specifications. The sidewall/edge of your tires should be smooth – no bulges, cracks, bubbling, or other variations. This sort of development is NOT a sign of normal tire wear, and warrants an immediate visit to your favorite local TireBuyer-affiliated installer. Also look for irregular cuts, cracks, or separations across the tread of the tire. Under normal use though, 10 years is a good reference point. If your tires are older than 10, you should probably consider a fresh set. This is because the construction/compound of tires, which is a primary contributor to tire traction and safety, degrades over time. 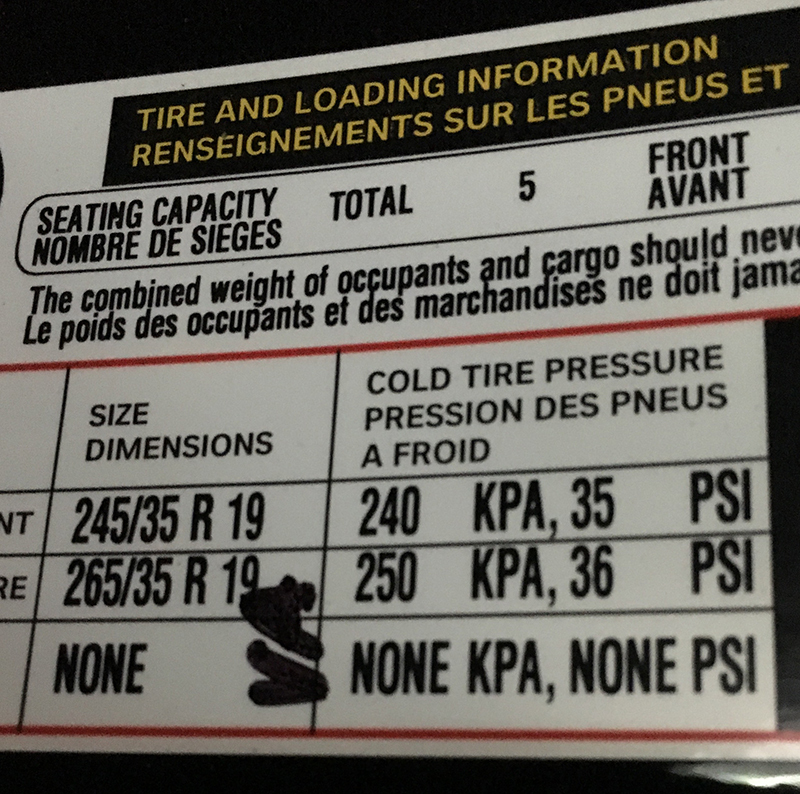 How do you know the age of your tires? 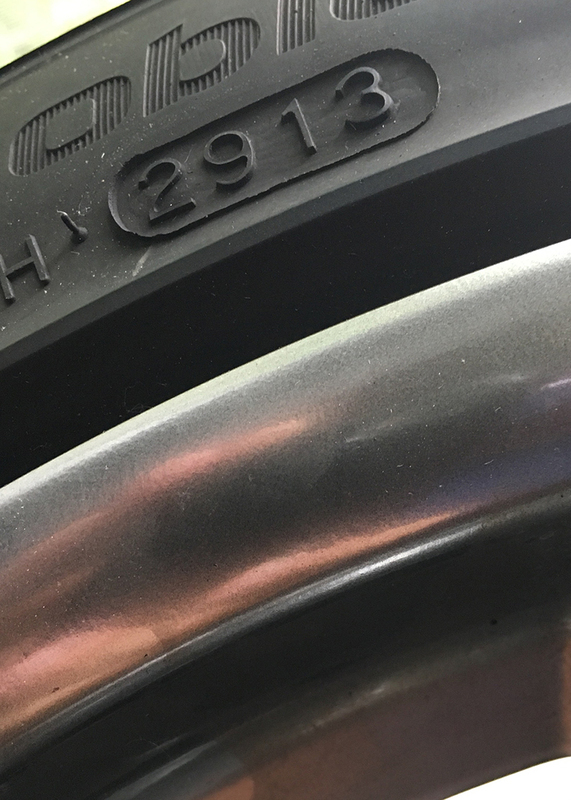 Simple – the “birthdate” is stamped on the outside sidewall of every tire in the format of week|year. In the example pictured below, the production date is 2913, which means the 29th week of the year 2013. As you’re completing this checklist, don’t forget that tire purpose is also crucial for driving safety. 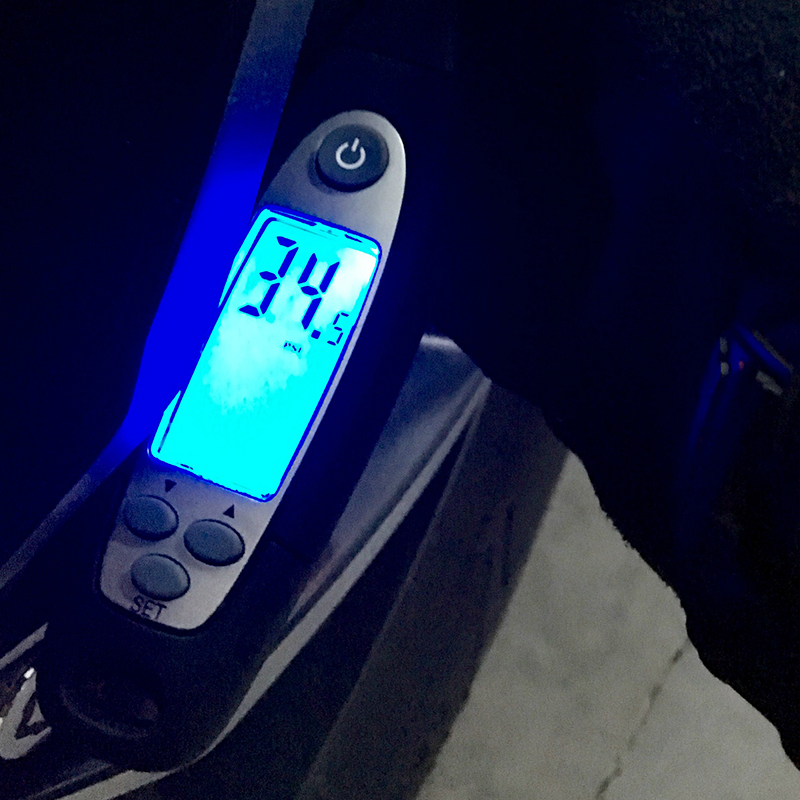 Even dialing in your tire pressures to the 10th of a psi, verifying condition and tread depth won’t count for much if you’re using tires outside of their intended seasons and environments. So heed the seasonal designations indicated by tire manufacturers. Summer tires are completely unworthy of use in freezing temperatures, and even “all-season” can be a misnomer – many all-season tires won’t provide sufficient traction in severe winter conditions. Most tires have both performance strengths and limitations. Being aware of these limitations allows you to steer clear of hazardous driving situations. Be tire aware, and follow these five simple steps once per month to help ensure your driving safety.